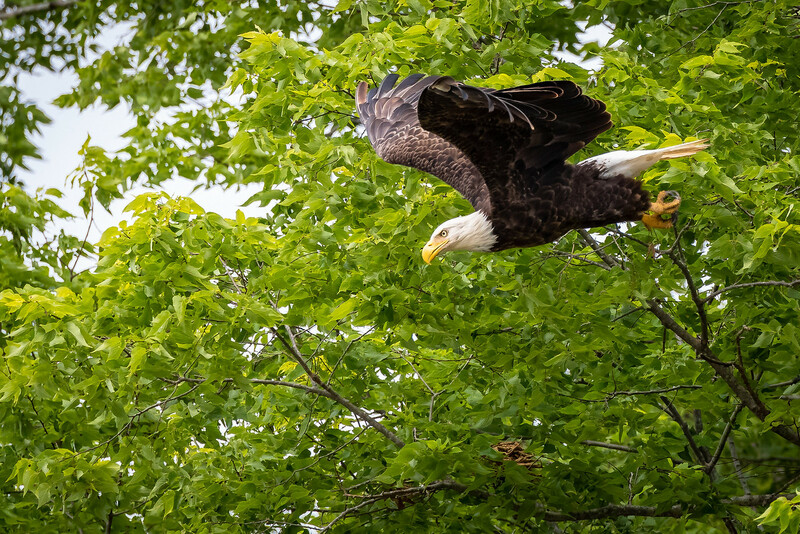 My spouse and I spent the morning of the 4th of July on the Wabash River north of Terre Haute, looking for wildlife and hoping to see some the of recent eagles that have returned to the river. Growing up in Indiana for over a half century, I never saw a native Hoosier eagle in Indiana, anywhere, although they definitely were here in Indiana when the Europeans first arrived. 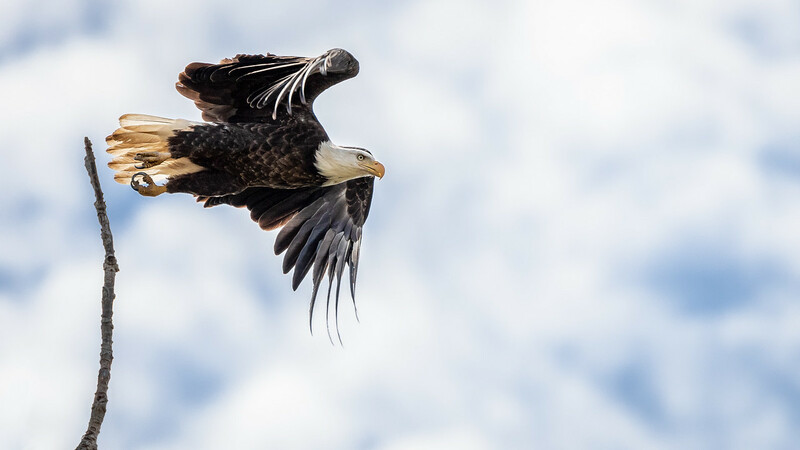 I am happy to say that bald eagles are home grown Hoosiers, now, with several eagle nests that I know of within 30 miles or so. 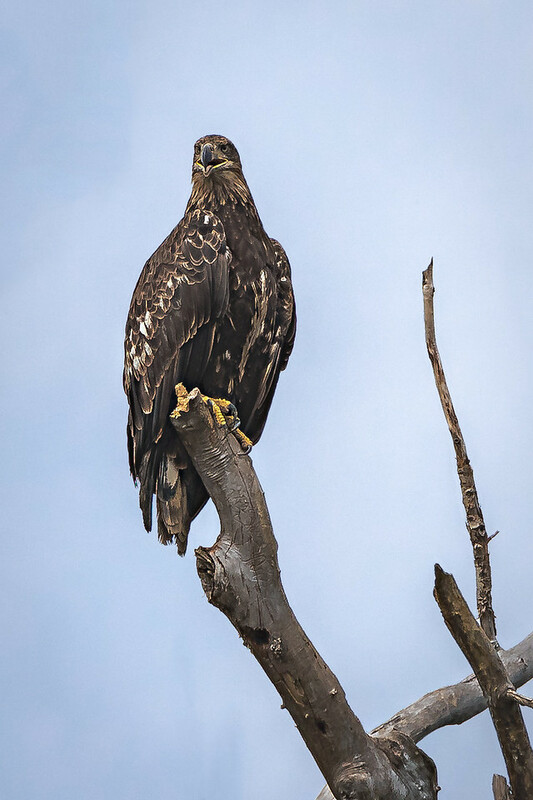 Yesterday, we saw several mature and juvenile eagles watching the river as we floated by them. Fast shutter speeds, and their associated high ISOs were required. 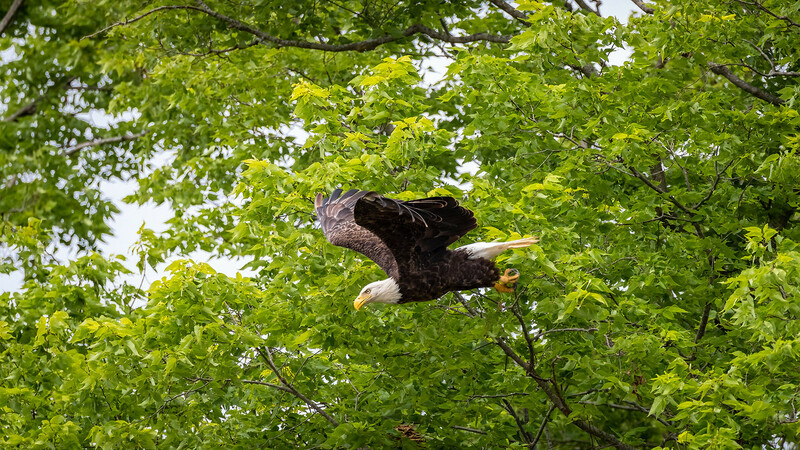 Shooting lots of frames in the brief time availble for a shot helps a bit, as the scene continually changes as the boat floats downriver, tips and rolls, and the eagle reacts to the wind, the water, and the new presence floating down the river. My favorite is the first shot but I also like the action shots. Thanks Denise. I liked the first image immediately too, when I downloaded it, despite the 6400 ISO. The action shots were actually nearer ISO 800-1000, but they were strongly back lit. I remember shooting with Harry in Florida, and he would always tell me that all a bird photographer needed was ISO 100. That was before I realized he was only shooting white birds in tropical sunlight. My birds up here are frequently deep into the forest shade. I really liked that these eagles all looked large, well fed, and healthy too. Jim, these are wonderful. What a proud looking Hoosier. 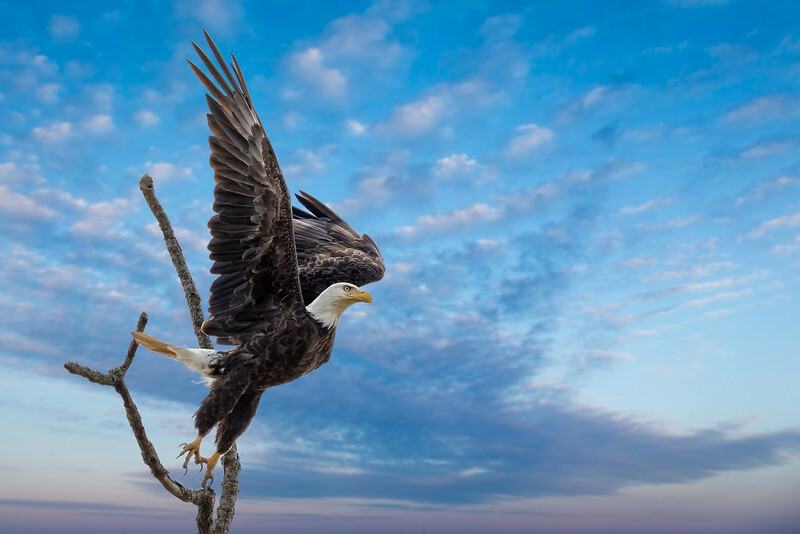 I remember some of the first eagles I ever saw, and they were in Alaska, years ago. 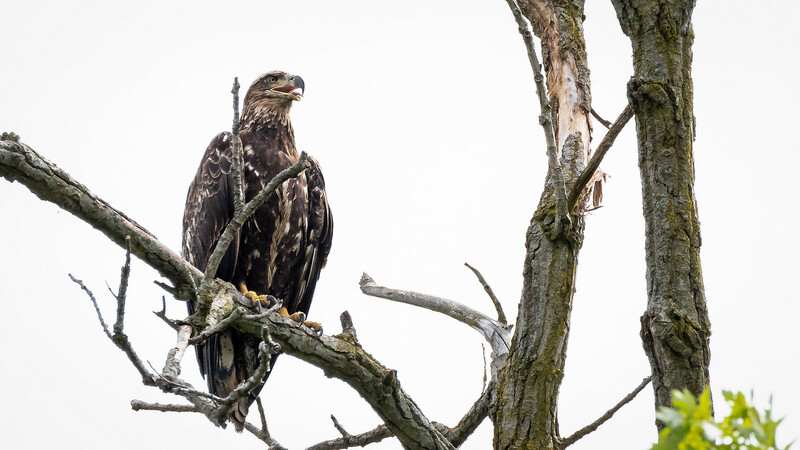 I really never thought I would ever see native Hoosier eagles, let alone several large healthy adults and juveniles. 'Loving' the first, second and fourth images, and liking/appreciating the third image. Appreciate the rich colors, especially the yellow beaks on the mature raptors. Great set. The first is outstanding--great clarity, color and composition. It was especially fortunate that the head is surrounded by a nice blur, which makes it stand out all the more. Thanks Kevin. I agree that the blown white sky and extra timber limit the third image, that of the juvie, but it was such a great looking juvie that I kept it. I spent some time trying to edit it, and select the sky and multiply blend it to bring back some blue, but decided finally it just wasn't going to work. Interesting, I did exactly that - multiply blended the sky for the fourth image or it would have been as white as the third. but it worked pretty well there. Richard, regarding the first image, I did not like that dark grey s curve to the immediate right of the eagles head in the dark area, but after several attempts with cloning and healing brushes just felt I couldn't improve over what was there - I am sure there are better PS wizards than I that might have had more success. On a side note, I feel like the Healing Brush is less effective than it used to be for me, for some strange reason, that I am unaware of. It frequently doesn't completely replace what I paint out now, but leaves vague shadows or ghosts of what I painted out left. Not really sure why this is happening in PS right now, but it is annoying. These are all wonderful - but I find the last one especially mesmerizing! The composition and clarity of the wing and tail feathers is spot on. Great shot. Super images, Jim. I like the last one of the first set the best. The sky came out great here. I see you used your TAMRON SP 150-600mm for this. Do you know prefer it to your Canon 100-400 now? Also, was this an organized boat ride, or your or someone's personal boat? Also, have you tried turning up the opacity on the healing (spot?) brush? Great set! I like the first and last one of the first posting. Hi Joel, I do not prefer the Tamron 150-600 G2 lens over the EOS 100-400mm v2 - but it certainly does have more reach which can be handy at times. I use them both, and i would say the Canon lens is ever so slightly sharper - but which is better frequently depends on which has the most accurate focus. When crisp focus is achieved, both seem quite sharp. I think the Canon MAY be a bit better at grabbing focus, but then it is a bit faster in aperture, and OEM. Both are fine tools for me. I have over 5,000 frames now with the Tamron lens in my LR catalogue, used extensively in Yellowstone , and locally chasing birds, so I have faith it. That means I have shot more than 10,000 frames with it I would guess, most of them at high frame rate - so far, seems to be holding up well. I have over 15,000 files with the EOS 100-400 v2 in my LR catalogue, so I have many more with it, so maybe I've shot over 30,000 frame with it since I bought it. I was in my own boat, a 17 foot aluminum skiff - I think I might prefer a more cahthedral hull to shoot from, as my boat has a bit of a roll. A pontoon boat would be ideal as a photographic platform, of course, I just don't want a pontoon boat as my only boat. Not a problem at 200mm, but once I get to 400+ it is quite notable, and at 600mm gets interesting at times. I suspect you have had the same experience shooting surfers with long lenses from small boats. Opacity - that is exactly what I am complaining about - it is like the opacity is set to 40 % - but my Healing Brush does not display any way to alter opacity - I only see Content Aware, Proximity Match, Create Texture. What I did finally figure out after your post, is that my Healing brush was set to a very low hardness of 5 or 10 ( a very soft brush ). When I moved the hardness back to 100% ( a very sharp edged brush ) things work much more as I remember them. This occurred after an Adobe update, as I never alter the hardness of the Healing brush that I can remember. Anyway, I think it is working better now, so thank you for helping me to sort this out. It's been bugging me. Praise from a fellow wildlife photographer - thank you indeed! Fwiw, Jim my pick would be #4 - with just a minor comment that - for me, it'd be even better if the bird's port wing wasn't degrading / compromising the head outline / silhouette. I prefer the bird's look / gaze / overall pose in 4 over that in 5, but a cleaner outline - similar to that in 5 would've been better. Good catch pp, I see that brown forward edge of the port wing just behind the edge of the white head that you pointed out. Now - could I clone that brown edge out and have it look right, or is it just best left as is. I'll play with a copy and see what I think. I understand the "eye pulls" in the other three images, contributed to by my limited ability to move my shooting position - I was happy just to be able to capture them at all from my floating vantage point. No one has commented about the second image, but I rather like it with the intense green background and the sharp eyes and posture of the bird hurtling down from a perch. It was not easy to keep the focus on the bird in that situation - the leaves are sharper edged than the feathers, and AF likes sharp edges. It is an image that is better in color than B&W, that's for sure. Thanks for commenting pp, I always enjoy and learn from your detailed comments, and sharp eyes. Here's another highly cropped image of that juvie, that is more of the type of simplicity you desire I think. Maybe just a hint of gesture in the juvie head posture. I just couldn't get close enough from the river's surface, and the bank borders on being quicksand. Re #2, I couldn't agree more about the posture / pose / intent of the subject - but, imo you could easily crop off a fair chunk of the bg and be left with a tighter / even better shot - and still have a decent amount of bg. Shifting the pic around in the browser window to lop off all of the top that includes dark branches and a bit off frame right to approx place subject in upper R thirds position would be a start if mine, methinks ? 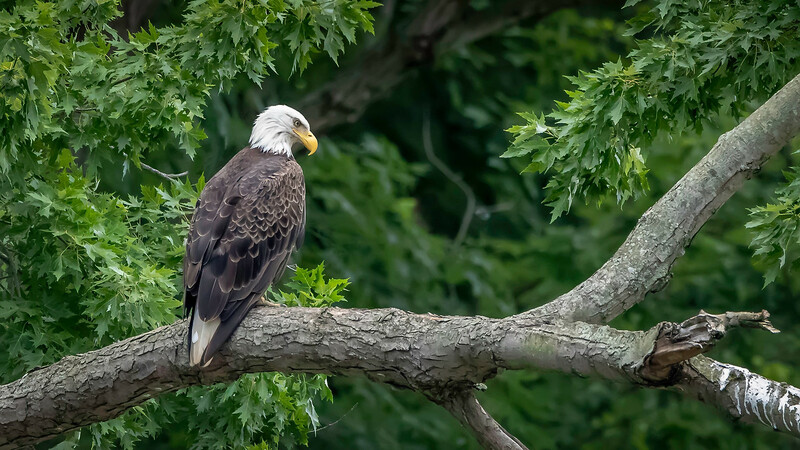 I do understand the desire to remove some of the greenery, but to me it was a shared subject - eagle and trees. Wow wow wow wow wow wow wow on last two! Posters!